Description: The young plant develops as a ring of leaves near the ground. 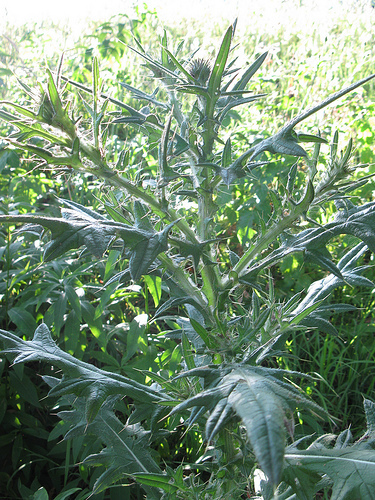 The mature plant can be 1.5 m tall. 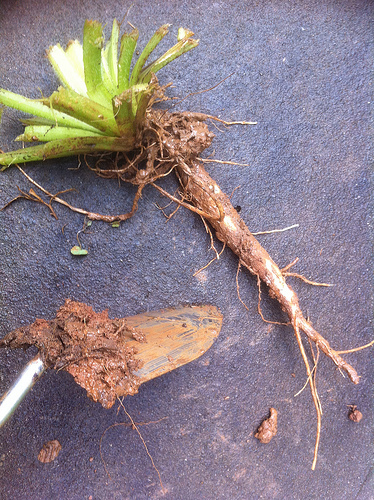 It has a well developed taproot. The stems have wings along them. The stem leaves do not have stalks and are 20-25 cm long. The leaves are lobed and the lobes are divided into 4 or 5 divisions which are often rotated. The edges of the leaves are spiny. The flower head is at the top of the plant and is spiny. Often there are 3 or 4 heads. They are purple. Notes: The flowers are a rich nectar source used by numerous pollinating insects, including Honey bees, Wool-carder bees, and many butterflies. Edible Uses: Root, harvested before the plant flowers, cooked. A taste somewhat like a Jerusalem artichoke, but not as nice. A rather bland flavour, the root is best used mixed with other vegetables. The root can be dried and stored for later use. The root is rich in inulin, a starch that cannot be digested by humans. This starch thus passes straight through the digestive system and, in some people, ferments to produce flatulence. Young flower stems, harvested before the plant flowers – cooked and used as a vegetable. Young leaves can be soaked overnight in salt water and then cooked and eaten or used in salads. The taste is rather bland but the prickles need to be removed from the leaves before the leaves can be eaten – not only is this a rather fiddly operation but very little edible matter remains. Flower buds – cooked. Used like globe artichokes, but smaller and even more fiddly. The dried flowers are a rennet substitute for curdling plant milks. 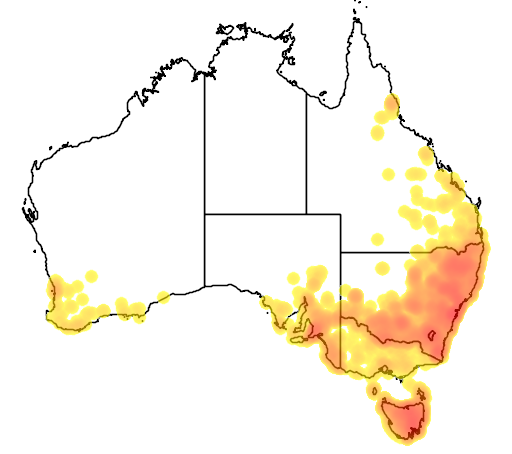 Seed – occasionally eaten roasted. Medicinal Information: The roots have been used as a poultice and a decoction of the plant used as a poultice on sore jaws. A hot infusion of the whole plant has been used as a herbal steam for treating rheumatic joints. A decoction of the whole plant has been used both internally and externally to treat bleeding piles. Other Uses: Oil; Paper; Tinder. Other Information: A fibre obtained from the inner bark is used in making paper. The fibre is about 0.9mm long. The stems are harvested in late summer, the leaves removed and the stems steamed until the fibres can be stripped off. The fibres are cooked with lye for two hours and then put in a ball mill for 3 hours. The resulting paper is a light brown tan. 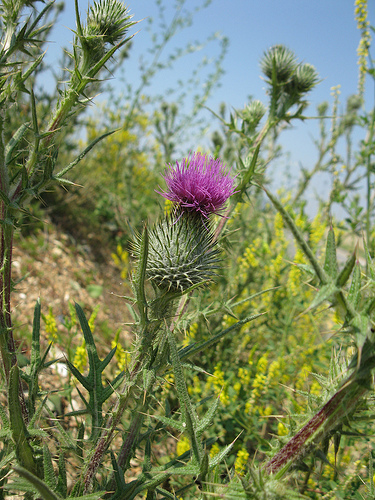 The seed of all species of thistles yields a good oil by expression. No details of potential yields etc are given. The down makes an excellent tinder that is easily lit by a spark from a flint.